The Extreme Moisturizer Masque creates a protective barrier against the damaging effects of our busy lives. This hair conditioner, full of natural botanicals, provides the moisture needed for dry and damaged hair. This hair mask leaves hair soft, smooth, and ready to face the elements! For all hair types, this Extreme Moisturizer Masque deep conditions even the driest hair. Is your hair frizzy, dry, unmanageable? Struggling with split ends? 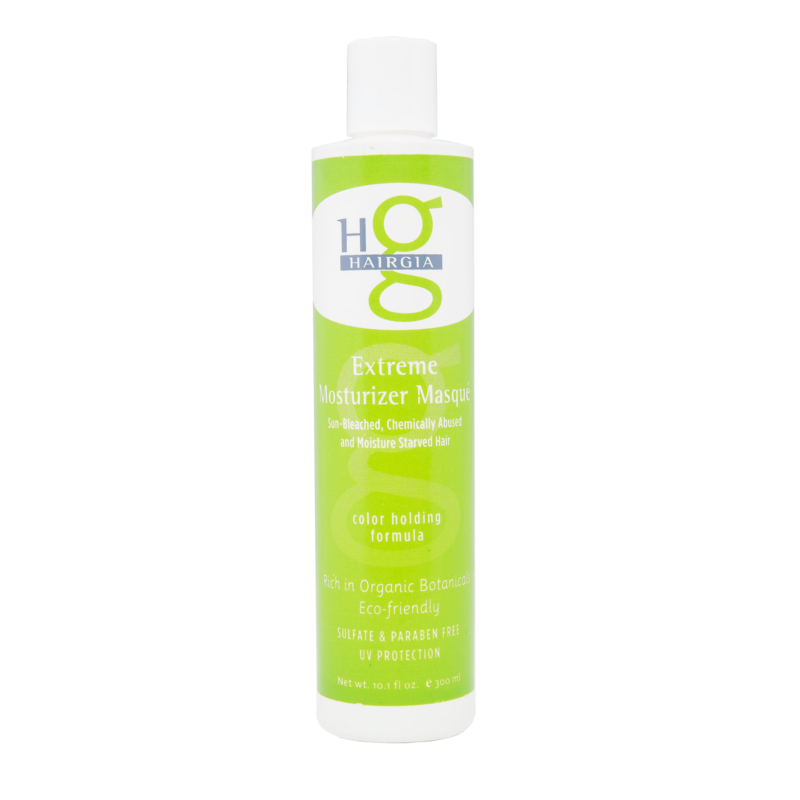 Perhaps your hair is color-treated and in need of a little extra moisture? Use our moisturizing hair mask to hydrate your dry locks, restoring a healthy shine and eliminating frizz! It also provides a protective barrier to shield your hair from the damaging elements we face everyday. Natural ingredients like aloe vera, ginseng, and rosemary provide your hair and scalp with the nutrients they need to look and feel healthy and hydrated, and as always, our products are sulfate-free! Use the masque as a daily conditioner after shampooing with your favorite HairGia shampoo, or use it as a deep conditioning mask a couple days a week to lock in moisture. DIRECTIONS: Shampoo your hair with a HairGia shampoo of your choice and then apply the Extreme Moisturizer Masque to wet hair. Leave the masque in for 2-3 minutes, then rinse. Apply our Saharan Liquid Gold Argan Oil to damp hair before styling for optimal shine and finish your hairstyle with Creative Hair Spray for all day hold. Here at HairGia we are committed to providing our customers with the highest quality hair products that are made with the best natural botanicals. All of our products are tested by our own HairGia family to ensure the best quality and results, and never tested on animals. Using natural botanicals known to promote the growth of healthy hair, our products are Earth-friendly and do not contain sulfates. Have any questions, comments, or concerns about our products? We love to hear feedback from our wonderful customers! Please contact us online! I LOVE this conditioner! It left my course, thick hair feeling soft and silky smooth. I would definitely recommend it.